The UFCW denounced last week’s ICE raids at Fresh Mark plants in the Ohio towns of Canton, Massillon and Salem, and called on the Trump Administration and Congress to work together and fix our broken immigration system. “Tearing hard-working men and women apart from their children, families, and communities is wrong. The people who do these incredibly difficult jobs have the right to due process, and to be treated with respect and fairness. Today’s actions will only drive this nation further apart, while also spreading unmistakable pain among neighbors, friends, coworkers, and loved ones. “Our top priority is to provide whatever assistance and counsel we can to any of our impacted members and their families. The broken policies that led to these and other workplace raids must be addressed immediately. They are creating a climate of fear where workers across this country are too afraid to stand up for their rights, report wage theft, dangerous work conditions, and other workplace issues. 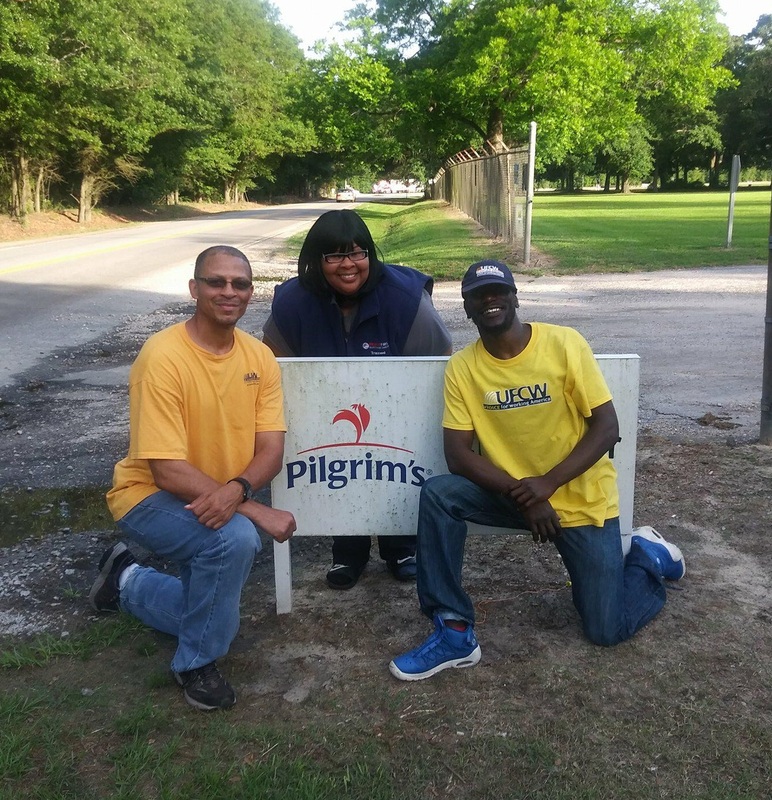 Pictured left to right: Chris Doubilet from Pilgrim’s Pride in Athens, Georgia, and Demetrius Stewart and Kawan Scarborough from Pilgrim’s Pride in Sumter, South Carolina. Over 800 Pilgrim’s Pride workers in Sumter, South Carolina, voted to join UFCW Local 1996 on May 2 by an overwhelming margin. 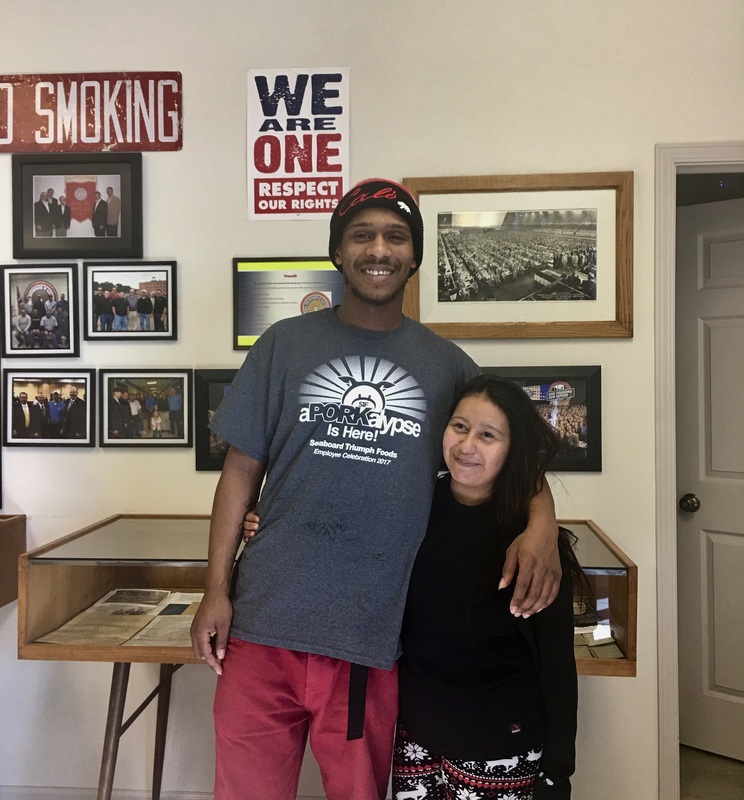 The workers, who process poultry, were concerned about treatment by management, insufficient wages and unsafe working conditions, including the denial of bathroom breaks. Pilgrim’s Pride Corporation is a Brazilian-owned, multi-national food company and the largest chicken producer in the United States and Puerto Rico. Member-to-member organizing made a significant difference in this campaign. UFCW members who work at Pilgrim’s Pride plants in Georgia and Florida met with the workers at the Sumter plant and helped them understand the benefits of standing together for dignity in the workplace. On Jan. 30, UFCW International President Marc Perrone released a statement regarding the U.S. Department of Agriculture’s (USDA) decision to deny the National Chicken Council’s (NCC) petition to eliminate line speed limits at poultry plants. Thousands of UFCW members who work in poultry plants sent comments to the USDA about the dangers of this petition. The UFCW also sent letters in October and December of 2017 to the USDA that highlighted how risky the NCC petition to eliminate line speeds would be for both workers and consumers. “This decision is a victory for hard-working poultry workers who hold one of the most dangerous and difficult jobs in America, and the consumers who depend upon them to provide chicken that is safe to eat. However, we remain concerned that poultry companies can request line speed waivers for individual plants. 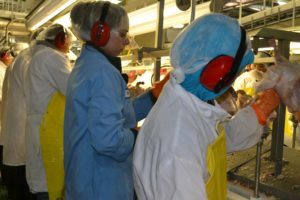 “In addition to putting poultry workers at greater risk of injury, eliminating line speeds puts consumers at risk by making it more difficult for both federal inspectors and quality control workers to properly check birds for contamination. UFCW International President Marc Perrone released a statement on Jan. 19 in response to the U.S. Department of Agriculture’s (USDA) decision to eliminate line speed limits at pork plants. This latest announcement follows the recent regulatory effort to remove line speed limits for the poultry industry. 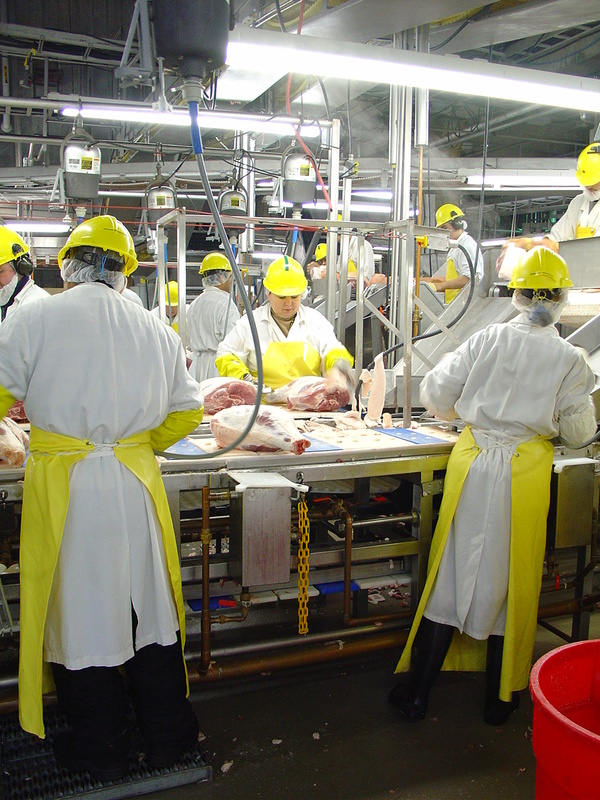 The UFCW represents hard-working men and women in pork plants that have already had their line speed limits eliminated as part of a trial program, as well as people who are in plants that run profitably with line speed limits in place. According to a 2013 report from the USDA’s Office of Inspector General, the existing trial program did not result in better food safety. “This desire to increase line speeds is being driven entirely by corporate greed and defies common sense. “Jobs inside pork plants are some of the most dangerous and difficult in America. We’re only putting workers at greater risk of injury and consumers at greater risk of consuming unsafe meat by asking everyone who labors inside one to work faster. On Dec. 21, the UFCW called on the National Chicken Council (NCC), the voice of the poultry industry, to set higher industry standards and stop the use of incarcerated and exploited labor by their member companies. In a letter to the NCC, UFCW International President Marc Perrone called on the NCC to take the lead in establishing a clear industry standard and give consumers confidence that their chicken is produced without these inhumane practices. 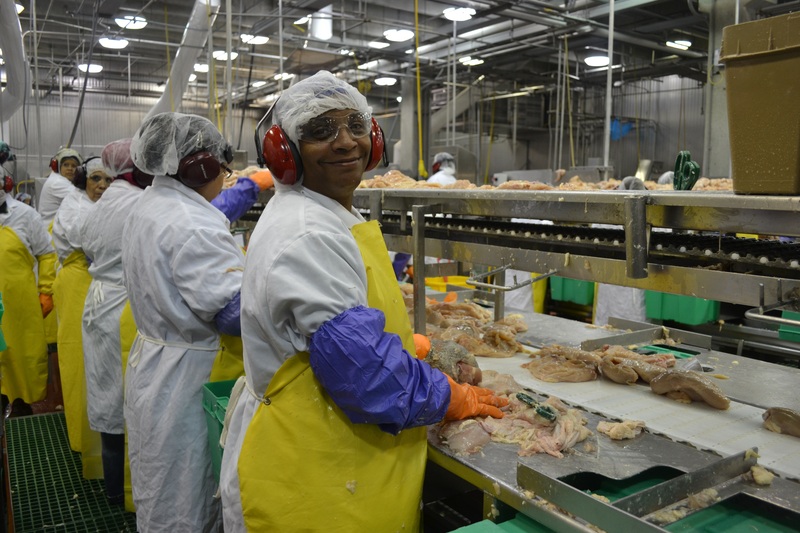 While more than 70,000 hard-working members of the UFCW family work in the poultry industry and earn better wages and benefits, the conditions in nonunion plants are far worse. A recent Oxfam report highlighted the struggles faced by nonunion poultry workers, including wearing diapers at work because they are routinely denied bathroom breaks. In addition, the industry has repeated problems with the use of incarcerated labor, underage workers and workers with disabilities being paid less than a minimum wage. On Dec. 7, UFCW International President Marc Perrone issued a statement in response to a new report from the Government Accountability Office (GAO) regarding safety and health in the poultry industry. This report confirms that the U.S. Department of Agriculture doesn’t consider worker safety when allowing new and dangerous chemicals to be used in poultry plants, and that OSHA can’t or won’t adequately protect poultry workers from injury. The GAO also found a pattern of poultry companies repeatedly denying access to federal safety and health inspectors, leaving workers in at least 15 plants across the South working in potentially dangerous environments. This report supports findings by Oxfam that poultry workers struggle to get adequate bathroom breaks, even to the point of endangering their health. Other GAO reports in 2005 and 2016 also found significant problems with safety and health in the poultry industry. “The hard-working people who work in poultry plants have some of the most dangerous and physically demanding jobs in America. This report sadly confirms that many of these skilled professionals who keep our food safe are struggling to keep themselves safe at work. They have earned and deserve better. UFCW International President Marc Perrone called on lawmakers to protect U.S. jobs, as well as the safety of our food supply, by opposing Agricultural Guestworker Act (AGA) of 2017 (H.R. 4092) in an op-ed for The Washington Examiner on Dec. 4. The AGA is a direct threat to America’s hard-working families, the incomes they depend on, and the food we all eat. This is not hyperbole. If the AGA becomes law, it will allow 450,000 foreign visa holders to work in agricultural and meat processing jobs that are currently held by hard-working American men and women. The impacts of this bill, particularly upon the hundreds of thousands of people employed by the meat and poultry industry, would be devastating. This bad bill does more than just hurt American jobs and workers – it also puts our food supply at risk. While we may not see food processing workers do their jobs, the truth is that they are highly trained professionals who perform dangerous and highly skilled work. These professionals serve as a much needed layer of protection for consumers when it comes to food safety because they know to quickly spot meat that is low quality or diseased. Like any high skilled and vital profession, current salaries reflect the quality and importance of this workforce, with wages as high as $23 per hour. By allowing untrained workers or guestworkers to hold these important jobs for as little as $10.88 per hour, the AGA will effectively drive down wages and destroy hundreds of thousands of good jobs in the process. At a time when we need to strengthen American jobs and make our food safer, the AGA would also allow guestworkers to stay for up to three years. That isn’t a guestworker – that’s a long-term employee and further shows how this bill is designed to both exploit foreign workers and replace American workers at the same time. Recently, 800 workers at Seaboard Triumph Foods in Sioux City, Iowa, voted to join UFCW Local 222. Seaboard Triumph Foods is a new, state of the art pork slaughter and processing plant, which opened this September. In the near future, the company will add a second shift, which will increase the size of the unit to over 2,000 workers. Because the UFCW represents other Seaboard plants in Oklahoma and Missouri and has established good labor-management relations, we were able to work out an election agreement with the company, which included card check recognition. Staff from Region 6 and our FPPM Division were able to sign up a majority of the workforce in two and a half days. On Oct. 11, UFCW International President Marc Perrone sent a letter to the Acting Deputy Under Secretary for Food Safety at the U.S. Department of Agriculture explaining why a recent petition by the National Chicken Council to eliminate line speeds at poultry plants poses a dangerous risk to American families. “This petition, submitted to you in early September, would allow select poultry plants to run their lines with no speed limits, endangering both workers and consumers. Even more troubling is that this petition essentially requests that USDA create this new “no speed limit” rule behind closed doors with no opportunity for notice and comment by the public as the regulatory process requires,” Perrone wrote. President Perrone’s entire letter can be read below. With the health and safety of over 250,000 thousand hard-working poultry workers in mind, 70,000 of whom are members of our union family, we write to urge you to reject a petition submitted by the National Chicken Council (NCC) to run food processing lines with no speed limits. This petition, submitted to you in early September, would allow select poultry plants to run their lines with no speed limits, endangering both workers and consumers. Even more troubling is that this petition essentially requests that USDA create this new “no speed limit” rule behind closed doors with no opportunity for notice and comment by the public as the regulatory process requires. Industry statistics show poultry workers are at twice the risk of being injured on the job compared to other workers and suffer illnesses at a rate that is seven times as high. 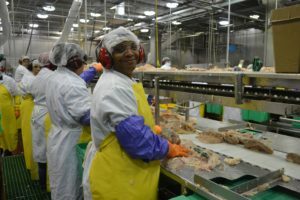 A 2016 report from the Government Accountability Office showed that forcing lines to move faster will expose poultry workers to higher rates of injuries and illnesses. Increased line speeds will also make it harder for both federal inspectors and quality control workers to properly check birds for contamination that could make consumers sick. Given the facts noted above, the petition from the NCC clearly poses a dangerous risk to American families. When the USDA chose not to raise line speed limits for poultry plants in 2014, there was large public interest in the open and transparent process (which we participated in) that ensured all perspectives on this proposed modification were heard – including those of the NCC. A wide array of people and interests, from workers on poultry lines to experts across the country, agreed then as they do now that faster line speeds will make this industry dramatically less safe, both for workers and consumers. For the sake of keeping hard-working families safe – whether they’re preparing, buying, or eating chicken – the USDA must reject this petition.